Normally, I'm not one to get all worked up about the lives of business people — as someone who slept through the majority of economics in high school, I can safely say that business is one of the few subjects I'm perfectly comfortable knowing nothing about. That being said, I generally try to keep up with each year's list of the most powerful LGBT business executives, as compiled by OUTStanding and the Financial Times. This year, though, I nearly fell out of my chair from happiness when I saw that for the first time ever, a woman has topped the list. And as if that wasn't awesome enough, she's also bisexual, an identity that is severely underrepresented in just about every field. Can I get a praise hands emoji? Actually, can I get 12 of them and a celebratory Cara Delevigne GIF? 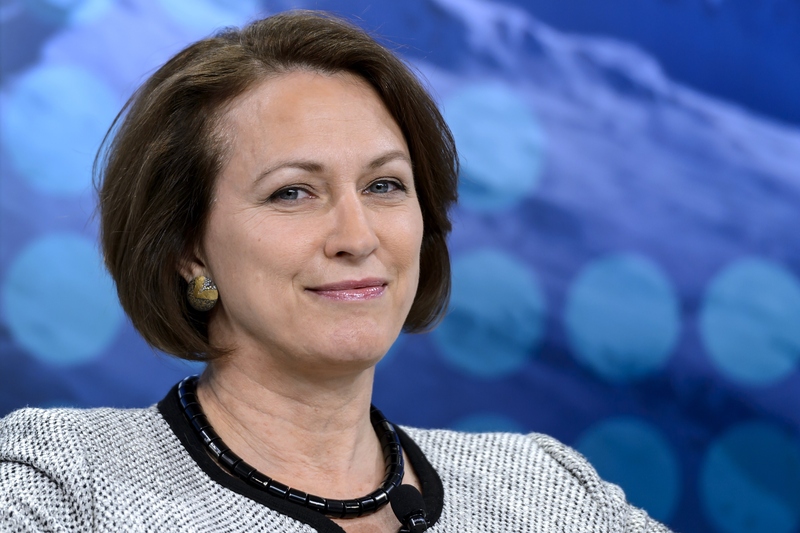 The woman in question is Inga Beale, the Chief Executive of Lloyd's of London. Not only is she the insurance market's first female CEO in more than 300 years of operation, but she's also one of the few, and perhaps only, openly bisexual high-ranking business leaders right now. According to OUTStanding, Beale received the award for her work with the company as well as initiatives to make the workplace more LGBT-friendly, such as the LGBT resource group Pride@Lloyd's. Activities undertaken to make the workplace a more welcoming place. Activities a nominee is involved with outside of the workplace that help to achieve positive change for LGBT people. Seniority and influence in the business. Attitudes toward the LGBT community may have taken a turn for the better in recent years, but we are far from out of the woods — bisexual and trans individuals in particular are still underrepresented and face mental health challenges as a community, as well as all kinds of other obstacles. The recognition of LGBT leaders and allies is vital for overcoming these obstacles, though; LGBT visibility is hugely important in the workplace, as well as in the rest of the world at large. So with that in mind, congratulations to this year's honorees! Let's take a look at the top 10 LGBT Role Models below. For all three complete lists, including the Leading Allies and Future Leaders, visit OUTStanding's website. As we've already discussed, Beale is CEO of insurance market Lloyd's of London. Joyce became CEO of Australia's largest airline, Qantas, in 2008, and under his leadership, it became one of the first companies to officially support marriage equality in Australia. The CEO of HSBC Bank PLC was named 2013's OUTStanding LGBT Role Model of the Year award. As CEO of the United Therapeutics Corporation, Rothblatt is one of few openly transgender business leaders working today. Brind-Woody is the Vice President and Managing Director for IBM Global Intellectual Property Licensing, but she also serves on several LGBT workplace-related boards in the UK. Reed is the CEO of Integrated Supply and Trading division (IST) at BP, as well as a sponsor of BP's Pride Affinity Network. Brooke-Marciniak is the Global Vice Chair of Public Policy for EY, and she has appeared on Forbes' list of the World's Most Powerful Women eight times. Bailey is the Chief Executive and Chief Creative Officer of Burberry, aka the clothing line that consistently rolls out some of the most beautiful ads known to fashionkind. Watson is President and Chief Executive Officer of Uphold, the company formerly known as Bitreserve. The Group Chief Executive Products for Accenture has been out of the closet since his first day of work in the company in 1987.